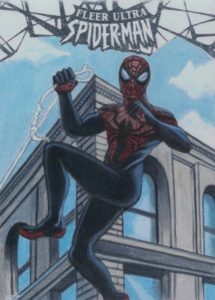 Evoking the feel of earlier art-based comic card releases, 2017 Fleer Ultra Spider-Man features the iconic webslinger and many others in an insert-driven Marvel product. 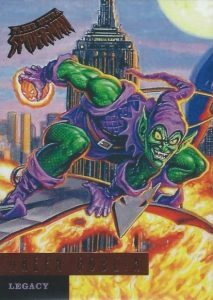 Containing all new artwork, the 100-card base set utilizes four subsets with designs taken from 1995 Fleer Ultra Spider-Man. 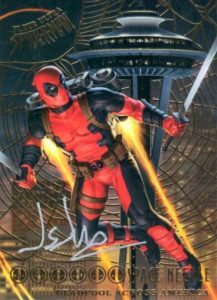 In addition to Silver foil parallels, there are also Gold foil (#/49) versions with on-card signatures from the artists. Chase inserts in 2017 Fleer Ultra Spider-Man celebrate the Upper Deck legacy from the 1990s with Precious Metal Gems (PMG) in Red (#/99), Blue (#/49), Green (#/10), Purple (#/5) and Gold (1/1) versions along with Jambalaya. Another collecting favorite, E-X Century features hobby-only Purple Tint parallels, numbered to the card number, while Royal Foil (#/99) offers Pattern 1 (#/25) and Pattern 2 (#/10) options. Other inserts include Holoblast Hologram, Metal Blaster, and Preserved Amber (#/175, #/15 or #/5). Concentrating on the title character, new Manufactured Webbing cards are issued for Spider-Man (#/49), Venom (#/25) and Carnage (#/10). 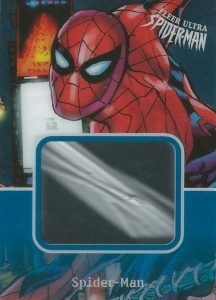 2017 Fleer Ultra Spider-Man also has other premium inserts, including Printing Plates, regular Sketch and Plexi-Sketch cards (on acetate), Autographed Coin cards, and Cut Comic Panel cards in single and Dual editions. 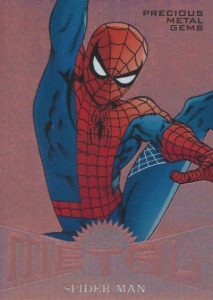 Celebrating the past, the modern product adds original 1995 Fleer Ultra Spider-Man Foil-Stamped Buybacks. 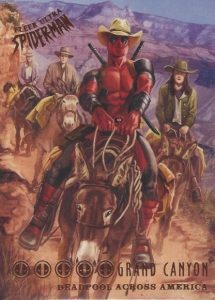 Illustrators for the set include Bill Sienkiewicz, Bob Larkin, Greg Hildebrandt, Luis Royo, Mark Texeira, Simone Bianchi, and Tom Fleming. 100 cards. 3 per pack. Shop complete base sets on eBay. PARALLEL CARDS: Silver Web Foil (1:3.5 packs), Plates 1/1. ePack ACHIEVEMENT PARALLEL CARDS: Silver Foil Board (One Per 10 Copies of Form 1), Rainbow Foil Board (One Per 10 Copies of Form 3), Silver Web Foil Silver Foil Board (One Per 10 Copies of Form 7), Silver Web Foil Rainbow Foil Board (One Per 10 Copies of Form 9). 99 cards. Serial numbered #/49. Shop on eBay. 25 cards. 1:600 packs. Shop on eBay. 25 cards. 1:160 packs. Shop on eBay. 25 cards. 1:1,200 packs. Shop on eBay. 10 cards. 1:6 packs. Shop on eBay. PARALLEL CARDS: Silver Web Foil (1:18 packs), Plates 1/1. ePack ACHIEVEMENT PARALLEL CARDS: Silver Foil Board (One Per 10 Copies of Form 2), Rainbow Foil Board (One Per 10 Copies of Form 5), Silver Web Foil Silver Foil Board (One Per 10 Copies of Form 8), Silver Web Foil Rainbow Foil Board (One Per 10 Copies of Form 11). 10 cards. Serial numbered #/49. Shop on eBay. 42 cards. 1:12 packs. Shop on eBay. 21 cards. 1:72 packs. Shop on eBay. 30 cards. 1:72 packs. Shop on eBay. 12 cards. 1:1.8 packs. Shop on eBay. 12 cards. Serial numbered #/49. Shop on eBay. 32 cards. Shop on eBay. 50 cards plus one ePack Achievement for complete set. Shop on eBay. PRECIOUS METAL GEMS PARALLELS: PMG Bronze #/199, PMG Red #/99, PMG Blue #/49, PMG Green #/10, PMG Purple #/5, PMG Gold 1/1. ePack ACHIEVEMENT PARALLEL CARDS: Patterned (One Per 10 Copies of Form 15). 12 cards. 1:5 packs. Shop on eBay. PARALLEL CARDS: City Scape #/15, Full Color #/5. PARALLEL CARDS: Pattern 1 #/25, Pattern 2 #/10. 11 cards. 1:12 packs. Shop on eBay. 11 cards. Serial numbered #/49. 107 artists. 1:80 packs. Shop on eBay. 2017 FLEER ULTRA SPIDER-MAN EX JAMBALAYA CASE HIT #30 BLACK CAT RARE SSP! !